Fukushima redux – design basis Godzilla? I am currently compiling an update for the Fukishima Nuclear Accident as of March 17. The situation is developing very quickly and commenters on this thread (March 16 updates) are doing an excellent job at posting regular updates. Meanwhile, here is a guest post from Luke Weston. Looks like we need an update post on the situation with the Fukushima nuclear power reactors. The situation continues to change and develop, but good, sensible, detailed information is still hard to find. In the wake of the Fukushima incident, it has really helped me to understand what happened in 1979 at Three Mile Island; with nonsense all throughout the media, and FUD, and panic spreading, with good information almost impossible to find, and with the over-abundance of bad information leading to hysteria. But this is the first time it has happened to the Facebook and Twitter generation; I’ve yet to determine whether that’s a good thing or a bad thing. We need to keep working hard to make sure it’s a net benefit for the good information, not the dodgy information. Why wasn’t the earthquake design basis set high enough?, some people ask. What if the next earthquake is magnitude 10? Magnitude 12? Magnitude 20? But where does it stop? Where do you set the design basis? What if the reactor is attacked by Godzilla? No matter where you set the design basis, you will always exceed it one day, eventually. And when you do, the anti-nuclearists will complain that the design basis is not set high enough. There is always some really extreme, really catastrophic situation that you can imagine, but what is its probability in any given year? It’s all about Probabilistic Risk Assessment. You know what the average probability per year of a magnitude 8 earthquake in the area is, what the probability of a magnitude 9 earthquake is, what the probability of a large tsunami is, etc. I’m not sure what the probability of Godzilla attack is. Need to ask an expert. Somebody get Matthew Broderick in here; he’s the guy to ask. And you decide what the acceptable probability of a severe core damage (“meltdown”) incident (which won’t hurt anybody but will probably write off the reactor, like TMI) for the nuclear reactor is in any given year – let’s suppose it is decided that one such failure per 50,000 reactor-years of operation is acceptable. Then, with that in mind, you design the degree of seismic hardening and safety engineering for the nuclear power plant so that you hit that target. It is the safest way to do it which is actually realistic. You can’t say that it’s absolutely 100% resistant to any hypothetical scenario of destruction that you can imagine, because there is always something that you can imagine that is more destructive. On 12 March, TEPCO announced that they planned to cool the Unit 1 reactor with seawater, adding boric acid to the water as a nuclear poison, to prevent any possibility of unintended criticality. The injection of fresh water and seawater into the primary containment vessel through a fire-extinguishing system line commenced on the 13th of March. This is not an injection of seawater into any part of the nuclear reactor or the Nuclear Steam Supply System itself. It is an injection of seawater into the containment structure surrounding the reactor pressure vessel. These reports confirm my earlier prediction that they were not talking about actually putting seawater into the nuclear steam supply system, despite the lack of any previous clear, sensible announcements in the press to this effect. Given that the reactor pressure vessel is completely intact and the control rods were fully inserted, normally, by the Reactor Protection System at the first sign of the earthquake, and the reactor is in a completely subcritical configuration, adding additional nuclear poisons (i.e. boron) to the system is seriously overkill; there is no pressing reason why it’s really necessary, other than to be extra conservative. ASIDE: “Going critical” isn’t some kind of catastrophe, it’s what a fission reactor is designed to do, which it normally does under normal operating conditions. Over March 14 and March 15, Unit 2 has been in a similar low-coolant condition to Unit 1, with coolant water being boiled off through the torus, and with the Emergency Core Cooling Systems, such as the Low Pressure Coolant Injection system, operating. Some kind of explosion was detected in the Unit 2 reactor building on the 15th of March, in a different area to the hydrogen ignition in Unit 1 and Unit 3. This hydrogen explosion was possibly within or close to the torus (the toroidal overpressure-supression tank), which is below grade, near the bottom of the reactor building. Although this explosion may have damaged the torus, it has not damaged any of the real containment structures, such as the primary containment structure, the drywell, the reactor pressure vessel, or the outer reactor building. There are valves that can be closed to isolate the vents that connect the torus to the drywell. Therefore, even if the torus was damaged or breached, it can be isolated from the drywell, meaning that there’s no real pathway between the drywell (the primary containment vessel) and the reactor building, through the damaged torus. That means that your key layers of containment are all still intact. There has also apparently been a loss of some of the normal reactor coolant systems in Unit 3, and the precautionary injection of borated water into the primary containment vessel, as at Unit 1, also began on March 13 and continued through to March 14. As with Unit 1, seawater has been being injected, in addition to fresh water, but it is into the drywell – not into the reactor vessel. There has also been a hydrogen explosion in the rooftop refueling crane space above the reactor building at Unit 3 – very similar to the explosion in the same area at Unit 1. Fukushima I Unit 3 is currently fueled with MOX fuel, containing recycled plutonium dioxide in its initial fuel load, in addition to low-enriched uranium dioxide. You might see some slightly different characteristics in this MOX fuel with regards to things like the void reactivity coefficient compared to ordinary LEU fuel, because the fission cross section, plotted as a function of the incident neutron energy, will look slightly different for 239Pu compared to 235U. So, if the cross-section doesn’t drop away as rapidly as you increase the incident neutron energy, for 239Pu as compared to 235U, then you might see a negative void reactivity coefficient that isn’t quite as strong. Stuff like that. But in practice there’s no evidence that we’re seeing any neutronic behavior or thermal behavior in the fuel that is any different, in practice, as far as the emergency situation is concerned, at Unit 3 as compared to Unit 1. There is no significant difference in the composition of the radioactive fission products, or in their potential to be released to the environment, in the MOX fuel compared to the LEU fuel in the other reactors. What we will see, however, is a lot of “plutonium phobia” in the media with regards to this MOX fuel, which is completely independent of any rational, fact-based discussion of the science and engineering. There’s this idea in the popular consciousness that plutonium is some mysterious, almost mythical, horrifying and terrible thing, and you’re going to turn inside out and die if you ever even look at it the wrong way. But plutonium isn’t something that’s been spawned out of the arse of a demon or something, it’s actually just another element. It’s radioactive, but less radioactive than most of the fission products formed in a nuclear reactor. The potentially harmful radioactive materials that might be released into the environment from a LOCA scenario such as the Fukushima I-1 situation, or the Three Mile Island accident, are the radionuclides of the high-volatility fission products, such as radioisotopes of xenon, krypton, and to a lesser extent, radioisotopes of iodine. Tritium is also on the list of key radionuclides that are present within the coolant water and are volatile enougn to potentially be relased, but its relatively low specific activity compared to the hort-lived fission products and its very low beta decay energy means that tritium is not significant in terms of its potential for harm. Uranium and plutonium, for example, are heavy metals, they’re not soluble in the coolant water, and they are nowhere near as volatile as these gaseous and volatile fission products. This means that there’s no way that these elements can escape out into the primary coolant and eventually find their way out into the reactor building atmosphere, as these more volatile elements can. This means that there’s no way that they will be released out into the atmosphere in the same way that very small quantities of tritium and gaseous fission products may be be released. Even if they could be, uranium has a negligible specific activity, and it is a negligible source of radiation dose – and plutonium is not extremely radioactive either; being less radioactive than the majority of the fission products. There is a small fuel transfer pool in the reactor building at each of these GE BWRs, near the top of the reactor pressure vessel, that is used for the temporary transfer of used nuclear fuel during refueling. However, the longer-term storage of the used nuclear fuel is done in a pool elsewhere on the site. Those storage pools, outside the reactor buildings, are seismically hardened and defended-in-depth, just like the reactors themselves, and there are no indications of any problems with them. Since there was no refueling going on at the damaged reactors at the time of the earthquake, there is little or no fuel in the fuel transfer pools. That’s my understanding of the situation, anyway. Is there actually some used nuclear fuel stored in the Unit 4 fuel transfer pool at the time of the earthquake? I don’t believe there is much, if any. Some media reports suggest there might be; but I’m extremely distrusting of the incomplete, garbled information being filtered out through the mainstream media on this whole issue – which is why I’m trying to patiently take information in from a diverse range of sources, and to patiently, carefully and skeptically piece it together into a self-consistent picture of what we actually know about the situation, based on my knowledge of the physics and my limited but partial knowledge of nuclear engineering. If there is some fuel stored in the transfer pool, we need to know a few things about it. How much is stored there? How long has it been there for? When was the reactor that it was taken from powered down, prior to fuel unloading? The decay heat of used nuclear fuel drops off exponentially following reactor shutdown, as the short-lived fission products that account for most of the radioactivity rapidly and exponentially decay. After a short period of cooling, the used fuel would not be significantly heating the pool water, nor would it require active cooling. Immediately after fission is shut down in an operating nuclear power reactor, the power output from nuclear fission ceases. However, the nuclear fuel is still extremely radioactive, at least initially, due to the presence of very short lived fission products with very high specific activities. But that decay heat output falls off exponentially over the coming hours, as the very short lived fission products decay. Thanks to Kirk over at Energy From Thorium for preparing this excellent chart, which I’ve borrowed from the EFT blog – all credit to him. Go and check out Energy From Thorium – it’s an excellent site. Initially, the decay heat power level – the heat emitted by the radioactive decay of the radionuclides present in the used nuclear fuel, in a subcritical configuration – is approximately 5% of the fission reactor’s normal thermal power output. The Fukushima I Unit 1 reactor has a nameplate capacity of 460 MWe. At a thermodynamic efficiency of approximately 35%, the reactor has a thermal power output of approximately 1.31 gigawatts. Therefore, immediately following reactor shutdown, the decay heat power output from the reactor’s nuclear fuel will be about 5% of that, or about 66 megawatts. Over the last 5 days since the shutdown of the reactor, however, that power output has been dropping off exponentially, and it is now somewhere down around 6 megawatts of thermal power. So, how much fuel is presently stored in the Unit 4 fuel transfer pool, if any? I might take an educated guess and say that it’s about one third of one full core loading, since about one third of the core fuel is replaced during one refueling. Let’s take a conservative guess, and say that it has been out of the Unit 4 reactor (which was already offline for maintenance prior to the earthquake) for about a week, at the least. It’s probably longer than that. If those assumptions are valid, then the radiothermal power output from the used fuel in the fuel transfer pool will be only about one or two megawatts at the present time, and still decaying of course. We know what the thermal power input from the fuel is, what the volume of water in the pool is, what the dimensions of the pool are, what the nominal temperature of the pool is, and what the specific heat capacity of water and the latent heat of evaporation of water are. Therefore, we know exactly what the temperature of the water of the pool is going to do, and exactly what the volume of water in the pool is going to do. There is no need for guessing or speculation. The nuclear fuel is made up of pellets of uranium oxide clad in tubes of Zircaloy. (Zircaloy is the trade name of the alloy in question, which is almost pure zirconium.) UO2 is a refractory metal oxide with a very high melting point – it is not flammable or combustible in any way at all. It does not burn. In theory, the zirconium metal cladding could burn, if it was removed from all cooling water, exposed to an oxygen-containing atmosphere, and heated to an extremely high temperature. However, it is almost impossible to burn a piece of zirconium in this fashion in practice. The rate at which the water in the fuel transfer pool would evaporate, in the absence of active cooling system functionality and in the presence of the fuel’s remaining thermal power output, is not more than a few percent of the water volume per day. Given that there is approximately 16 feet or more of water above the surface of the fuel assemblies in the pool under normal conditions, it will take many days to weeks for this water to evaporate to the point where the fuel is potentially exposed above the surface, assuming that no additional water was added by any other mechanism. The outermost layer of the multiple layers of containment surrounding the reactors – the cuboid-shaped reactor buildings – have walls and a roof made of solid concrete. On top of the concrete reactor buildings, however, there is an additional part of the structure – it is not made of concrete, but it is made of steel, with steel sheets over a steel frame. This steel building on top of the reactor building houses the fuel transfer crane, and it is built on top of the concrete roof of the reactor building. 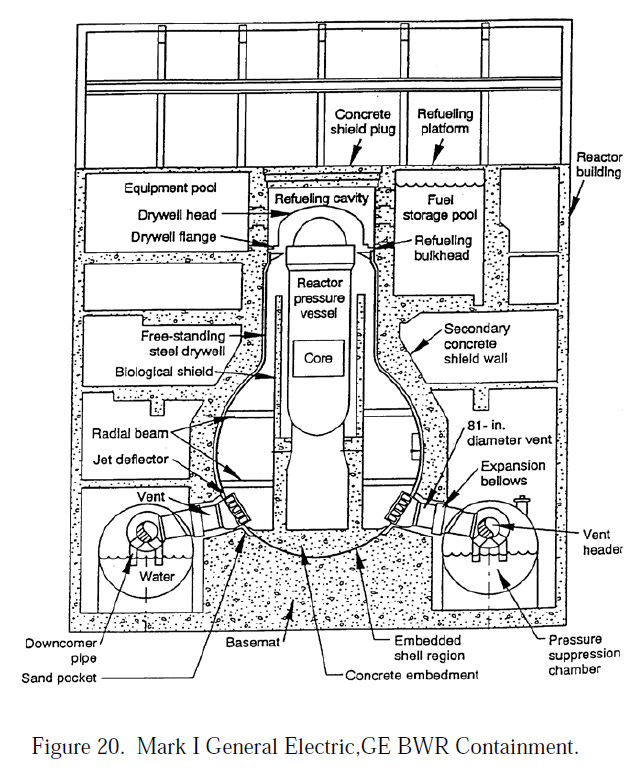 That is, the part of the structure above the concrete shield plug and the refueling platform at the top of the concrete reactor building, as shown on the diagrams below. It is this relatively weak steel structure on top of the reactor building, which is not really part of the reactor building proper, which has been blown out by a hydrogen explosion at Fukushima I Unit 1, as I described in my previous post, and apparently at one of the other Fukushima I reactor buildings as well. The concrete roof of the reactor building proper – which is not where the hydrogen explosion occurred – is built over the top of the temporary fuel transfer pool; the pool is protected within the concrete reactor building. On 14 March, an explosion of hydrogen gas in the steel-framed structure atop the Unit 4 reactor building occurred, similar to the earlier explosion at Unit 1. As was the case at Unit 1, there was no real damage to the reactor building proper or any of the other layers of containment within. On March 14, a fire was reported in the Unit 4 reactor building. The fire was caused by a leak of lubricating oil in the mechanical drivetrain that drives the reactor’s recirculation water pumps. Contrary to inaccurate information which was spread widely in the media and the social-media grapevine, this small fire had absolutely nothing to do with the used-fuel transfer pool or any fuel which may have been in it. The fire was extinguished shortly after. It has been reported that the crew of the Nimitz-class carrier USS Ronald Reagan, off the Japanese coast, has detected the presence of radioactivity emitted from the Fukushima nuclear power plant. Since she’s nuclear powered, the vessel is obviously carrying sensitive instruments and sensors for detecting the presence of radioactivity around the ship, and obviously they’ve detected the trace levels of radioactivity that have escaped into the atmosphere. It’s possible to measure the presence of small traces of radioactivity fairly easily with extremely high sensitivity. Just because we’re able to accurately measure it and quantify it at very low levels doesn’t mean we’re dealing with levels of radioactivity that are anywhere close to harmful levels. Has anyone actually reported the actual quantitative presence of radioactivity that was detected aboard the ship? At the time of the March 11 earthquake, all four operating units at the Fukushima II station were automatically SCRAMmed by the Reactor Protection Systems. Although there were some reports of disruptions to the Emergency Core Cooling Systems at Fukushima II, all the Emergency Core Cooling Systems at all the reactors were restored to operational status. Between March 12 and March 14, every one of these reactors has been bought to a safe state of cold shutdown, where the decay heat from the nuclear fuel is being completely dissipated and the fuel is being kept cool, with no rise in fuel temperature. What may be the source of the high levels of radioactivity? That doesn’t square with your assumptions about the amount of spent fuel in the tank, IMO. The reactor was taken offline on Nov 30, per IAEA by the way. It might be extremely cynical, but there is a magnitude of earthquake that will cause all buildings to collapse, killing all inhabitants and obviously it doesn’t matter then that the reactor doesn’t survive – as long as the effects remain local. Perhaps successful SCRAM wold suffice for that. I predict that one day Finrod will eventually die (of natural causes) much like the rest of us. My statement is about as interesting and useful as his is. fission power display graph dependent on some level of cooling? Well done. I do have very minor issue with the term ‘no way’ regarding leakage, preferring ‘appears extremely unlikely’. My questions are regarding the apparent gaping hole in the side of the #4 containment building? and the impact of possible loss of most or all water in the fuel storage pool? (recognizing that the pool doe snot abut the exterior wall of the building. The point being that there is always a finite level of physical disruption which will be accounted for in the design of any physical system, and above that there will be a higher level of physical disruption which is possible… and indeed inevitable, if you wait long enough. There will be many useful lessons drawn from this accident. Or at least, they’ll be useful so long as our civilisation doesn’t surrender to the counsel being offered by the anti-nukes. Except the fact that the pool on 3 and 4 have COMPLETLY evaporated, and are emitting enough radiation to kill or incapacitate anyone near the pool. Question: What is happening to the water that is being poured onto/into the reactors? Is it likely to become contaminated or have high levels of radiation etc? I’m wondering where it is being drained to. Is it collected or returned to the sea? He should be so lucky ..
Unit 4 was in a refueling outage and had offloaded the complete core for a vessel inspection. They have a complete core plus fuel still cooling off from the previous outage. It has the most fuel in the pool compared to any others. That is why the NRC has made statements that they have about the most of the water being boiled off. They now the number of sticks in the pond and the decay heat curves plus the info of the SFP temp last reported (84C I believe). Its not to hard to calculate the results. Sorry that is “reports as in “media reports”, not some sort of accusation! I agree it is not possible to build anything that is 100% reliable under all circumstances, but in the Risk Assessment one needs to look at not just the probability of the event occurring, but also the impact of the event. Only then can you decide if the project is worth considering and what other options are available. There will be many useful lessons drawn from this accident. Or at least, they’ll be useful so long as our civilisation doesn’t surrender to the cowardly counsel being offered by the anti-nukes. Um…. maybe put the generators or backup generators somewhere dry in case there is a 7m wave instead of 6.5m wave? Or is that just being cowardly? And of those 53 power reactors, only one is behaving in a somewhat abnormal way in its shutdown state – Unit 1 at the Fukushima I Nuclear Power Station. (Fukushima Dai-Ichi, as opposed to Fukushima Dai-Ni, which is the Fukushima II plant.) The other 52 are completely normal, either operating or behaving as predicted in a shutdown state. To see that 52 out of 53 are behaving completely normally, and many are still operating normally, generating electricity on the grid, in the wake of one of the strongest earthquakes the world has ever seen in an industrialized area, shows you just how resilient nuclear power infrastructure is in response to natural forces like this. UPDATE: At the time I wrote this, what I above was accurate and there were no concerns about the state of any of the power reactors other than just this one. It is now the case that there are issues at a couple of the power reactors, and the above is not strictly accurate. However, the phenomena and the systems I have described below in the context of Fukushima I Unit 1 are still relevant to understanding what is happening at the other reactors. In Congress today, (US) NRC Chairman Gregory Jazco’s Congressional stated that he thought the spent fuel storage pool of Unit 4 is dry, and that he has gotten reports that Unit 3’s pool may be cracked and losing water. link. Can you or Barry comment on these two questions? I also posed the first question to the MIT Nuclear Science & Engineering students running the new MITNSE blog, which appears to be developing into a reliable source of information. ATOMS, on 17 March 2011 at 12:47 PM — You cannot possibly know that. Stick to the facts. If there’s so little spent fuel stored in the pools, why don’t the plant officials just say so? And why are the pools heating up, when you claim they shouldn’t do so? And why the need to go to all these desperate efforts to add water to those pools? And what is the source of the large plume of steam from unit #3, or the spike of radiation associated with the fire atunit #4? On another matter, it was my impression that the fear of “accidental criticality” was the reason for adding boric acid to the seawater. If, as you claim, seawater is only being added to the drywell, not the reactor vessel, why would that fear exist? And since we know that the fuel rods have been partially (and in the case of unit #2 possibly fully) exposed, are you saying they are maintaining two separate water pumping systems, fresh water for the reactor vessel, seawater for the drywell? Forgive me, but reading this is giving me flashbacks to Baghdad Bob. posted 17 March 2011 at 1:10 PM by Jan R.
If you add the shared storage (60%), the pools at units 1, 2 and 3 (17%) and the dry storage (6%), there’s 83% of the spent fuel storage capacity with status currently unknown. Good job on getting concise no-nonsense information out. But I think Luke needs to re-think some of the information about these pools. For example unit 4 has more fuel in it than you are assuming. Plus, the refuel floors of these units have been through an earthquake, hydrogen explosions and fire. I wouldn’t assume that the pools of unit 3 and 4 have all their water available to them. The USNRC has stated that they believe the unit 3 pool has a crack and the unit 4 pool doesn’t have much if any water in it. And of those 53 power reactors, only one is behaving in a somewhat abnormal way in its shutdown state – Unit 1…..UPDATE: At the time I wrote this, what I above was accurate and there were no concerns about the state of any of the power reactors other than just this one. So there’s no power or cooling after a 9.0 earthquake & tsunami and you have “NO CONCERNS” about units 2,3,&4??? WTF. Blind optimism is useful in many walks of life but nuclear power isn’t one of them. What in the world are you on about? I was referring to calls to shut down the nuclear power industry worlfwide and abandon it forever. To whoever censored my introductory comment: How did I violate the rules with that one? @Dan: Drive-by accusations of this sort only underline the complete intellectual bankruptcy of the overwhelming majority of the antinuclear posters here. When you can’t make a real argument, the traditional fall-back position is that anyone that disagrees with you must be an industry shill. It is getting tired. no fuel being stored or no water? I went to your link, and I see “16 March, 05:00 UTC: no data” for the pool in unit #4, which is the one that is allegedly dry. posted 17 March 2011 at 1:54 PM by Jan R.
Glad that PRA is finally being discussed! Watching the hearing on the Hill today was frustrating. Sen. Boxer was harping on the fact that the plant in Japan was “only” designed for a magnitude 7.5 (or whatever the correct magnitude is, I’m not sure), but not for a magnitude 9.0. Just saw tepco say on NHK that they still found water in the 4th reactor pool and none of the fuel rods are above water. Therefore, they’re focusing on cooling down the 3rd reactor. They just sprayed water via helicopter, and they’re readying to spray water from the ground as well. There is also talk of possible restoration of power to the 1st and second reactor from an external source. I haven’t really found why only the 1st two reactors are considered for restoring power, nor I don’t know where they’re bringing the power from. “There are valves that can be closed to isolate the vents that connect the torus to the drywell. Therefore, even if the torus was damaged or breached, it can be isolated from the drywell, meaning that there’s no real pathway between the drywell (the primary containment vessel) and the reactor building, through the damaged torus. You leap from the statement that valves cam be closed, to the assumption that they were closed without offfering any evidence that this is actually true. Can you offer your reeasoming for assuming that the valves were closed? You are using mockery to make it sound as though it is stupid and absurd to ask why these plants were not built to withstand a magnitude 9.0 quake and attendant tsunami. But that is not an absurd question at all, in the way that it would be absurd to ask about a magnitude 20 quake (100 billion times as energetic as this quake), or about Godzilla. Firstly, quakes of this magnitude are known to happen. Second, the Japanese Govt and the nuclear authorities there have been warned in the last ten years that the safety standards to which these reactors have been designed are insufficient for the known risks of geological instability in the area where they have been built. But they declined to act. Lastly, you suggest that once we have set an acceptable risk threshhold, that we should just have done and design to that threshold. That would be fine if estimating risk were an exact science. But of course it isn’t. We might think that a magnitude 10 quake is a once in a 10,000 year event. But really, that is just an educated guess based on our current, imperfect knowledge of geology and tectonics. It has a pretty wide error term around it which we ought to plainly acknowledge So if we wish to avoid hubris, we should substantially over-engineer, even to our chosen acceptable risk threshhold. My understanding is that these reactors were designed to withstand an 8.2 quake. To me, that looks to have been an incredibly stupid design decision and a legitimate target of criticism. The warnings to this effect in recent years show that this is not merely the wisdom of hindsight, but that we are dealing here with genuine folly. Which is why it is preferable to use technology where the worst case isn’t so catastrophic if something does happen that in fact you were unable to plan for. Steve Gardner, on 17 March 2011 at 2:05 PM — It is not clear that there is a rock which could support enough strain to occasion an earthquake with a magnitude in excess of those already measured. Granted that when the earlier units (and perhaps the later ones) were designed and built, plate tectonics was not fully understood. However, it is now known and has been for two to three decades that subduction zones are generally capable of creating magnitude-9 earthquakes with quite large tsunamis. These attributes of subduction zones are a *feature*, not a weird, unlikely, unforeseeable bug. You don’t have to be an earth scientist to know this. I am very surprised and disappointed that this is not being acknowledged here. In contrast, magnitude 10 to 12 earthquakes have never been documented from terrestrial causes and are only expected from the impact of very large extraterrestrial objects. Citing them in relation to the rational assessment of seismic hazards is a straw man, nothing more. Even back in the late 60s, we’d already seen the 1964 magnitude-9.2 Alaska earthquake and tsunami, and the 1960 magnitude-9.5 Chile earthquake and tsunami with waves up to 25 meters in height, both occurring in areas that are very active geologically. Japan is one of the most geologically-active places in the world. Even back in the late 1960s, prudence would dictate especially high engineering standards for nuclear facilities in such a location, with extra attention being paid to backup systems. Once subduction zones were well understood, the plant owners had two to three decades to reevaluate their facilities and retrofit main and backup systems (for instance, relocate emergency generators) to account for advances in the earth sciences and the sure knoweledge that they are in close proximity to (actually, overlying) a subduction zone that very reasonably could be expected to produce an earthquake and tsunami of the nature just experienced. They failed to do so. In a U.S. court this would be ruled criminal negligence. I can’t believe that this atrocious breach of responsibility is being defended by those who so strongly assert that they are fact- and rationality-based. This Godzilla post is simply not credible and harms your case. If seawater is not being pumped into the core, what isthe use of adding boric acid to it. Outside the pressure vessel, this boron will have little if any neutron absorption effect. Oops- that should be “knowledge” in the fourth paragraph. My careless error. The reactors rode out the quake. The tsunami did in the EDGs. If you look at the site using Google Earth, you can see that they (TEPCO?) excavated the existing 100 ft plus bluffs down to near sea level for the plant site. Why? Probably to reduce the head that the seawater cooling pumps would have to work against if the plant had been placed on top of the bluff. Possibly also to reduce the opportunity for an earthquake to cause the bluff to crumble and the plant to crash into the sea, but the plant could have been placed far enough back from the bluff edge to eliminate that possibility. Lastly, by excavating the plant site down, they placed the plant below the line of sight for anyone inland looking out to sea. Was it for PR purposes (“out-of-sight, out-of-mind”), or was someone thinking that if there was a massive radiation (not contamination) stream, the existing bluff would act as a natural shield? I don’t know. What I can say is if the EDGs had been placed on top of the bluff and just cables run down to the reactors, then this accident would have been a non-event. This would also have separated the EDG fuel from the reactors. What this accident reminds me of is the events that lead to the SUBSAFE program. We didn’t stop building subs, but we took a long hard look at design and construction. FYI, I am a retired USN LCDR, Qualified Engineer, EOOW and PPWO on Nimitz-class A4W plant. I don’t know if it’s already been mentioned but a big irony of this is that AFAIK, three generators with a more than adequate supply of steam to run them are completely shut down and unused and were unused right from the beginning of this event. Is there any reason why they couldn’t have kept running the generators using the residual decay heat they are trying to get rid of? The generators could keep producing power for as long as the heat lasts and of course, once the heat is no longer significant, the power is no longer needed. Somewhere on the Richter scale there is an Extinction Level Event [ELE]. An ELE = 100 million megatons equivalent explosive power. I guess that might be around 13 on the Richter scale. There is clearly no need to design for more than that. A better thing to do is to replace Gen 1 and Gen 2 reactors with Gen 4 unmeltable reactors. The real thing that needs to be done is education. So far there have been ZERO casualties at Fukishima. Yet people in the US are buying iodine pills. Coal company propaganda is very effective. Where is the vaccination against this nonsense? People have to be in panic to do things as foolish as take iodine pills when they are thousands of miles away. They don’t know basic things like that there has always been natural background radiation. They don’t know how big a millisievert is. They don’t know how big a lethal dose is. And they don’t know that TV journalists don’t know anything about it. @Bill DeJager – The problem with criticisms of this type, is that very few make them about other technologies. Somehow, nuclear plants are held to much higher standards than other installations that might fail. Keeping in mind that it was the tsunami precipitated the failures at these reactors, and not the earthquake, are you going to make the same criticisms of everything else, man made, that got washed away in this event? In other words, if what you are suggesting, that it was incompetent not to design and build these plants to survive this scale of event, are you making that accusation for every other structure that was damaged. Because if you are, I note that these other failures led to very large death-toll, far greater than what the reactors have been responsible for. If you are not, them I submit you are being hypocritical. If you live in Chernobyl the total radiation dose you get each year is 390 millirem. That’s natural plus residual from the accident and fire. In Denver, Colorado, the natural dose is over 1000 millirem/year. Denver gets more than 2.56 times as much radiation as Chernobyl! But Denver has a low cancer rate. Average American gets 361 millirems/year. Smokers add 280 millirems/year from lead210. Radon accounts for 200 mrem/year. Although radiation may cause cancers at high doses and high dose rates, currently there are no data to unequivocally establish the occurrence of cancer following exposure to low doses and dose rates — below about 10,000 mrem (100 mSv). Those people living in areas having high levels of background radiation — above 1,000 mrem (10 mSv) per year– such as Denver, Colorado have shown no adverse biological effects. Calculations based on data from NCRP reports show that the average level of natural background radiation (NBR) in Rocky Mountain states is 3.2 times that in Gulf Coast states. However, data from the American Cancer Society show that age-adjusted overall cancer death in Gulf Coast states is actually 1.26 times higher than in Rocky Mountain states. The difference from proportionality is a factor of 4.0. This is a clear negative correlation of NBR with overall cancer death. It is also shown that, comparing 3 Rocky Mountain states and 3 Gulf Coast states, there is a strong negative correlation of estimated lung cancer mortality with natural radon levels (factors of 5.7 to 7.5). So media reports are talking about the risk of the fuel rods in spent fuel pool #4 melting down. But the pool was probably around 25 C when the quake happened on the 11th, and on the 15th it was at 84 C. That’s not a very scary rise in temperature, considering the fuel rods melt at 2000 C. It seems there’s not very much decay heat. With the water moderator gone, the reaction (if any) will slow down if anything. I must be missing something here.. Why is this a concern at all?? The common single point of failure in this accident was power outage. You need power to cool the reactors (and SFR pools). You need to actively cool the reactors. Period. By all reports the generators were not knocked out by the earthquake they were knocked out by 1m of water coming over the wall. Not one or two generators were knocked out… ALL the generators and backups. You don’t a 10 billion dollars to put your generators 3 meters higher or maybe backups on the other side of the building. It doesn’t cost much to put your generator’s fuel tanks underground or somewhere where they can’t be easily knocked around. You don’t need “Probabilistic Risk Assessment” to see there’s a big damn ocean at your doorstep and know the ocean can be big and angry. I agree that you can’t plan for everything but don’t hide behind “Probabilistic Risk Assessment” when reality doesn’t fit the plan. It isn’t necessary to label people anti-nukes for questioning assumptions. I have been reading updates and comments for 4 days now from this site. I have no experience or education with regard nuclear technology and reactors. I observe that there is an enormous effort on this site to deliver informed data and opinion (based on education and experience in the respective field) combined with an effort to dispel flawed data and misinformation offered by the media. That being said, I find an enormous disconnect between the apparent conclusions (and assumptions) posted on this site and the documented activities and radiation levels posted on apparently reliable media sources linked from this site. I also find an enormous disconnect between the levels of risk presented by the (apparently) educated posters on this site, compared with the type and level of response from workers at the site of the incident and the indicated levels of radiation detected at the site. Despite my levels of ignorance with nuclear technology, I am intelligent and aware enough to recognize a significant disconnect with what is being reported by the media and what is being reported on this site. I would appreciate a response that seeks to resolve the clear disconnect I have suggested. Net/Net, if there is little to no threat of a primary containment breach and there is little to no stored fuel in the storage ponds, and this is really not a big deal, why does the level and complexity of response escalate day by day. Why do the peak levels of recorded radiation continue to increase day by day? Why are apparently informed and educated organizations, escalating their response and reaction to the event day by day? I would appreciate an informed and detailed response. fp: every report I’ve seen indicates that there being no water would be a serious problem. The last english NISA release ( http://www.nisa.meti.go.jp/english/files/en20110317-1.pdf) stated that the operators were injecting sea water into the Reactor Pressure Vessel (RPV) of Unit 2 and into the Primary Containment Vessel (PCV) of units 1 & 3. Can you interpret their teminology for me? Luke – It makes no sense to me to inject seawater (SW) into the annular volume between the Rx vessel and the primary containment. This would attempt to cool the water/steam mixture inside the RX vessel and therefore reduce the pressure by conducting the heat away through the Rx vessel? If the purpose is to keep the core covered, and demineralized water is not available, then any type of water in the core is better than no water. Sure, the SW would boil, increasing the salt concentration, but who cares. At that point, you’re going to decommission the core and pressure vessel & piping anyway. I think your flowpath only makes sense if the operators do not have working high-pressure pumps and/or electricity to power them, so they can’t get water into the Rx vessel against the pressure. That creates a catch-22 situation: if they vent enough steam to lower the pressure to a point where they can pump water in, then they risk flashing the existing water in the core and possibly uncovering the fuel elements. They would have to be ready to start water flowing into the core as soon as the pressure became low enough (piping with check valve and pumps already running at shutoff head), because if they tried to vent steam to lower the pressure, then shut the vent valves and then start the pumps/open the pump outlet valves, the Rx pressure would have already risen and there would be no flow into the core. Yes. Why? The water acts as a coolant, but it seems the rods don’t need much cooling if it takes them 4 days to heat the water ~60 degrees. fp: Because that’s a large volume of water that’s being heated. Heat transfer to air is far less efficient, so absent the water, most of the heat stays in the much smaller volume of the fuel rods themselves, hence heating them up much, much faster. posted 17 March 2011 at 3:11 PM by Jan R.
Water boils at 100C. Boiling water evaps quicker. Once the water gets to a certain level above the rods, it doesn’t take much time for the temp of the rods to start to increase rapidly. The temp of the rods will get high enough for an accelerated zircaloy water reaction. Hydrogen is created (exposion/fire on refuel floor of unit 4). Clad oxides rapidly to failure releasing fission gases and associated radionuclides. High dose rates and a hot spot on the ground between the two reactors (300 mSv/hr) is probably debris expelled from the SFP. We didn’t see the pool steaming away on unit 4 because the secondary containment covered it. I think we’ve been seeing the pool on unit 3 steaming away over the past two days. All of the pools should be the real concern now, plus the cores of units 5 and 6 (either partially loaded or completely loaded). There must have been some damage from the quakes to the pools of 3 and 4 for them to get so low. This statement of yours seems (alas) to be incorrect. A reader at the MITNSE blog provided this link to a TEPCO slide presentation of 16 November 2010 PDF). Slide 9 shows the status of the spent fuel pools and the separate on-site longer-term storage facility. As of March 2010, there were 3,450 fuel assemblies in the four pools at the reactors, an average of ~900 per pool. A reactor core contains about 600 assemblies (I’m not sure about that number). Yes, that seems to be the case amac78. As Tony Irwin pointed out, according to the IAEA, unit 4 was shutdown for routine maintenance and refuelling on 30 Nov 2010 and all the fuel core (548 fuel assemblies) transfered to the SF pond. Units 5 and 6, although shutdown, have the fuel back in the core, so there will only be about third of the core spent fuel from refuelling in their SF ponds. Similarly for units 1-3, I would expect there to be SF from the last refuelling in the reactor SF pond as most of the previous SF will have been transfered to the shared SF pond. This may explain why unit 4 reactor SF pond is more sensitive to loss of normal cooling. Clearly, nuclear plants need to hire Mothra. I want to point some facts about current situation that appear to be false in the article and also in some comments. 1. The Fukushima Daiichi plant was designed to withstand 8.2 point seizmic activity very likely occuring directly below the plant and not som 100km away. So the actual seizmic acitivity at the plant was LOWER than 8.2 it was designed for. And as such it withstanded it probably without any serious harm. 2. The 1st. reported damage came with the tsunami size of 7m exceeding the level the plant was designed for. This is the main source of the catastrophic events that unfolded here. It was predictable that such big tsunami eventually hits here, so this is presumably the mistake made by planners of the plant. 3. The sea water IS pumped directly to the reactor core and also to the primary containment as reported by almost all status tables reported at this site. 4. Also in the document mentioned before, there is a reported low level in both 3 and 4 reactors SFPs and also Damage to fuel rods in poll 4 suspected. Numbers 1. to 4. are at stright contrast to this post statements. Number 5. disproves one comment under this post, but could not locate now. Help a layman out here. You are saying they are spraying water OUTSIDE the reactor? Wouldn’t that be like cooling the inside of my oven by spraying water on the outside of the oven door (Or submerging it if the containment structure is intact). And don’t they eventually need to replenish the water in the reactor after venting? Also I see, there has been a mixup between Celsius and Fahrenheit here. To my understanding the zirkonium casing melts at 1200 C (= 2200 F) and not 2200 C.
AFAIK reactor 4 was shut down in november. Then it was de-fueled in preparation of an inspection to the chamber. There is at least a full load in the pool and it’s not extremely old. I would not be surprised to learn it still gives a thermal megawatt or three. Can it heat up to the equivalent of a partial meltdown? I’m no expert and do not know. But at minimum I’d expect those rods, especially if exposed, to be very happy to oblige the no-nukes and provide abundant cesium and iodine injections straight into the environment. Containment vessels work as intended. But only for the rods you put inside them, not for those you put beside them. Two things, IMO, are dangerous in Fukishima Daiichi: a core meltdown (no, I do not think it would be contained. In case of a full meltdown there will be an explosion and we’ll have all sort of fission products flying up a few hundred meters) and these “spent fuel” rods with no containment at all. Neither is directly dangerous for humans further away than a bunch of kilometers. Both are extremely dangerous in terms of indirect effects (food chain) if very meticulous checks are not implemented. This is no Chernobyl, unless we make it so. The lesson from Chernobyl is not about graphite, it’s about vegetables and milk. In the interest of keeping this site useful for those looking for reasoned discussion of the fluid situation in Japan, it would be helpful if we could dispense with the off-topic comments and opportunistic anti-nuclear dribble. It is tiresome and unproductive. @steve it’s more like cooling a pressure cooker that sits in the kitchen sink by filling the sink with cold(er) water. Anyway pretty all reports I’ve seen say that they are actually pumping seawater into the reactor vessel itself, not just the containment vessel. Your statements about seawater are not in accord with the JAIF reports which explicitly state that seawater is being injecteted into the core *and* the containment vessel for units 1,2 & 3. NHK/TV (English) reports that the wind, which has been blowing west, will shift to the north, on Friday. a mention if it were true so I’m not sure where the NRC Chairman is getting information from. opinion is being mixed with updates in the articles… the result is debates on multiple topics like Unit 4, background radiation, Design Basis and Godzilla. I agree that it exhausting and lacks a cohesive thread. Can I suggest posting the splitting updates into more discrete topics? I think it would help keep the commentary more focused. The tsunami deaths were not the result of structural failures of buildings. Even had the buildings stood, everyone unable to get above the level of the wave would have been swept away and drowned. In one of the towns in Miyagi, the tsunami drill involved sheltering on the 3rd floor above of the local hospital. Unfortunately, the wave reached the 3rd floor and everyone sheltering there was swept away and drowned. But the building was not destroyed; those sheltering on the 4th floor and the roof survived. > there is little or no fuel in the fuel transfer pools. Please skim back through the earlier threads for references already provided — just search for “pdf” and “ppt” file references, if nothing else. On that one, for example, I cited the PDF giving the June 2010 fuel inventories for the cooling pools in the first thread, four days ago, and have repeated it at least once since. I’ve also pointed in earlier topics to the references about pumping seawater into the cores as well as the containment — doing so against steam pressure to try to keep the core covered; how that was stopped by a stuck valve; pressure readings, and so on. If you can refute a factual claim please cite a source, we all need to be checked and facts corrected here, very few of us are working with anything first hand. @fp As already pointed out, a lot of water takes time to heat up. I’m no expert but water in those pools is supposedly circulated or at least replenished. This is what is not happening now. If it evaporates or boils out it will stop working as a moderator, but also as a refrigerant. The main concern however is not that those rods can go back critical, but that they are not “contained”. AFAIK water circulation (and low temperatures) is what is supposed to filter volatile fission products for the rods in those pools. @Tomas Zirconium melts at 1855°C (3371°F). The rods are made with a Zircaloy (an alloy with around 98% zirconium) so the exact melting point may be a little less than that, but I doubt they can go all the way to 2200° (either C or F). Just realized it: 1855°C is 2128.2 K, so that 2200 figure is probably just that. Just this sentence makes it clear enough that you have no idea about the probability of a mega thrust event hitting Japan. Just by this introduction I was turned of to read the rest of the article, I am sure it doesnt worth my time anyway. If you decide you want to research a bit more on historical earthquakes and tsunamis that have hit the area, I will be happy to provide references of published studies. Till then, I say you have no idea about what you are talking about. look under the knowledge link in that site, thats what you luck. In case its to hard to navigate through the links here you go. @Steve Gardner – So you are saying the only structures adversely effected by the tsunami were the reactors? I’m afraid the record fails to support that contention. Trains were washed off their tracks, and levies were breached all over the country that had been built to defend against tsunamis. The fact is that there are failures of structures and installations in Japan that have cost lives, items that were claimed to have been designed to protect people from this type of event. You cannot single out the nuclear power stations in this regard, particularly as their failures have not had the impact others have. It is simply hypocritical to hold a nuclear power plant to a higher standard than any other installation the failure of which could potently cost lives. The fuel rods stored in the spent fuel pool (SFP) at unit #3 are the main concern right now. The water level is *not* gone, but it is getting very low. There was a helicopter survey yesterday which determined that there was still some water in the SFP at unit #4. So, SDF helicopters dropped some water on #3 instead this afternoon, and water cannon trucks are going to spray water up into the #3 SFP soon. This operation is critical to prevent a major release of radioactivity. The pools at #5 and #6 have less spent fuel in them than #4. Unlike #5 and #6, all of the #4 fuel rods were removed from the core and put into the SFP there. However, the temperatures of the SFP’s in #5 and #6 are increasing and will become a concern if power is not restored to run water pumps for the facility. Nevertheless, there may be a good reason to hold nuclear power plants to a higher standard than other kinds of installations, and that is the long term consequences of failure. Miyagi and Iwate prefectures have been devastated, but the clean up and rebuilding can commence almost immediately (just as New Orleans is being rebuilt.) I won’t pretend to expertise I don’t have, so I’ll phrase this as a genuine question: what is the long term prognosis for the plant and the 20-30km exclusion area around it, if there is a serious breach in containment? Will people still be able to live there? The meat of the situation is the safe design issue. Of course nothing is 100% safe,but I have to wonder whether this site was realistically safe. Given most years the globe sees a mag. 8-8.9 earthquake somewhere,and plenty of evidence for large tsunami in the past on many of the world’s shorelines,the plant seems to have under-engineered on tsunami defense. Did cost-benefit analysis really find that this was acceptable? I also have to ask,while recognising that there are limits to what can be spent on safety, is the layout really the best they could arrive at? I know space is at a real premium in Japan,but everything is too close together,the cooling pools are too close to the reactors,and the need to quickly re-route power and water access to each reactor has been badly compromised by the layout. They are water-bombing now. Surely this was not seen as a fall-back option in the design and approval of this site. Are they waiting for all the water trucks to arrive or do they plan on using the police water cannon by its self. It’s almost 4pm in Japan. A number of individuals have expressed the sentiment that the design engineers and the industry should have foreseen the 9.0 magnitude earthquake and attendant tsunami. To not have done so equates with sheer stupidity. If that were the case, wouldn’t the dumbest mistake have been to allow over a million people to live within 10 kilometres of the sea coast. If the planners had seen to limit any human habitation along the coast they would have saved the lives of 10,000-plus people last Friday, perhaps even 25,000. As it is, we are dealing with an industrial emergency emergency, and that is really what it is, that will be probably be limited to less than 10. For a comparator, let’s not forget the oil-well blowout in the Gulf last summer cost 11 lives, decimated the local fishing economy, and appeared to threaten the viability of a key global ecosystem. May I remind the commenters that the question what risks are acceptable to society is not a scientific one, and especially that not all risks of a given probability times impact value are the same? Nuclear power has an extremely thin but extremely long tail on the impact scale, and the question it boils down to is ‘would you bet the inhabitability of your country on a few diesel generators’. Especially, again, when maintenance of said generators are in the hand of some company that does not care for unlikely events, and of politicians that allow reactors to continue to be operated that aren’t even designed to be safe to earthquakes already observed at the site? I am not, and this is not a matter of scientific (aka ‘ideal world’) risk analysis. The spent (aka used) fuel pools are not generating hydrogen. They are not boiling away. They are not empty. UO2 CANNOT burn, it is already fully oxidized. (That is what the O2 part of the compound equation is.) Between 90-95% of the material in a used fuel pool is UO2. Those levels can be easily explained as simply a matter of a reduced amount of shielding above the still radioactive used fuel. Pools normally contain about 7M of water, the tenth thickness of water is .7 meters. You lose 70 cm of water, the dose rate above the water increases by a factor of 10. As swimmers know, it is never surprising to see clouds of steam rising from hot water on a cold day. However, even with an increased rate of evaporation, pools take a long time to empty out. All that said, adding even centimeters of water back to a pool is not something that a few helicopter loads can handle. They cannot carry all that much water; the stuff weighs a kilogram per liter. It takes a 2,000 liters to raise the level of a pool that is 10 meters wide by 20 meters long by a centimeter. A CH-46 medium lift helicopter has a capacity of about 3,180 kg. It would require 63 trips to raise the water level one meter if my guess on fuel pool dimensions is reasonable. See why they want to bring in fire cannons to top off the pool? This is not desperation, it is simple math and logistics. @T-Squared: The difference is that the people there choose to live there. If you don’t you can just move up the hill a bit. It was not the decision of the people to live in reach of Daiichi, instead the NPP was built in front of their noses, and it turns out to be quite hard to find any civilized place that is not downwind from some old NPP. Also, tsunamis and earthquakes are over fast, while we are almost a week into the domino at Daiichi, and there is still no telling how this is going to end. It’s the psychological equivalent of a tsunami wave that is just standing in the sea and no one knows whether it will just recede or instead wash over Tokio. I don’t see why you wouldn’t go back to life as normal in the 0-20 km and 20-30 km region. There has been no large scale contamination by radioactivity. I haven’t heard the Japanese government recommend anyone in these areas take their KI pills. They rebuilt Hiroshima and Nagasaki and there must have been measurable traces of radiation after those two blasts above background levels. Along those lines, why are the Yanks so paranoid about the possibility of a radioactive plume reaching their coastline. There was quite a bit of atmospheric testing of nuclear weapons in the 50’s and 60’s much of theirs. Altogether the radioactive fallout from atmospheric testing was considerable more than from the Chernobyl event and no one was running to the local pharmacy for iodine pills. I also like to think that us kids from the 50’s and 60’s turned out okay; none the worse for wear, so to speak. @Rod Adams: You’re off by a factor of 100. 200 cubic meters would raise the water by a meter, not a centimeter. I don’t know where you live, but where I live you don’t allow people to build and live in the flood plain. It is called zoning laws. Why didn’t the municipal planners anticipate a 9.0 magnitude earthquake and attendant 30-foot tsunami and create a no build zone. Hell, I would rather be standing at the end of the day dealing with a psychological equivalent of a tsunami than be dead. Wouldn’t you? Nick, the problem was caused by the electricity going out, and the diesel generators that run the pumps in that situation getting swamped by the tsunami. These type of reactors need water pumps running at all times to keep them cool. The site of the plants is not the issue. The problem is that these reactors need active cooling at all times. No electricity, and you have problems. There are reactor designs where if the coolant pumps are disabled, it’s not a serious problem. We need to start building those kinds of plants. Rod: do you mean 63 trips to raise by 1m? not 1cm? If there is no cooling to pool, the water boils potentially exposing the spent fuel. If more water is never added, then you’ll have completely exposed rods to the air. Releasing lots of radiation. Xirconium coating and steam/water reaact hydrogen is released which can then ignite. If spent fuel rod starts to burn, it will releasing radioactive gases directly into the environment. Where did you get this reading and how old is it? Thanks for asking. I need to revise my math quickly. 10 meters is 1000 cm, not 10,000. 1000cm x 2000cm x 1 cm = 2000 liters, not 200,000 liters. Still following the situation, but not actively on BNC anymore. Happened across this one, thought it might be of interest. Not that I’d want to interrupt the rampant speculation with actual data, but I’m going to anyway. Pre-water-drop and post-water-drop dose rates were steady at 3.7 mSv/hour (3,700 uSv/hour) as measured from the main administrative office building (reported as “100 and several tens of meters” from unit 3, which means probably somewhere between about 130-180 m away). As usual, I wonder about the dose the workers are receiving. At 3.7 mSv/hour, it doesn’t take that many hours to accumulate a substantial dose. Mike – so why would a worker just sit around in a high dose area. Time, distance, shielding. We train for this stuff. It is not rocket science. those measurements are from Reactor 3 not 4. I know, I do the same training. But when that’s the dose rate in the area you’re working in, that’s the dose rate you receive, right? …Well, that’s the dose rate you receive, minus the effects of PPE such as a breathing apparatus and a hazmat suit. I’m not really sure how much their PPE reduces the dose. What job do you think they need to get done that prevents them from cycling away from higher dose areas to lower dose areas? For example, I would suspect that they will set up the water cannons using some kind of stand, turn on the hose and then back away. I suspect that the people who set up the sea water filling arrangements did their valve line ups or their equipment set ups turned on the flow and then backed out. They most likely went back and checked their handiwork every now and then. If you want to see what kinds of radiation dose rates it is possible to work around without hurting anyone, I highly recommend reviewing the SL-1 film. You can also listen to The Atomic Show Podcast where I interviewed Ray Haroldsen, a technician who was responsible for picking up the pieces after the team he was a part of performed the BORAX experiments that purposely blew up a small BWR in the Idaho desert in the mid 1950s. We spoke a few years ago, Ray was in perfect health. Seamus,I’m aware the power supply failed and the back-up generation was flooded. The site of the plant is part of the issue:it needed to be better defended. We have billions of dollars in plant here,a dedicated site,an enormous investment in the need to maintain good will,and a market for power going forward.. Where was the best design,and the back-up to the back-up? And where was the site design calculated for getting quick access through damaged structures and debris? Not at Fukushima… we now have a dead power station,with many years before the site will produce again. Has anyone ever de-commissioned a damaged light water reactor before? @Rod Adams, my old uncle Joe smoked a pack a day until he was 80, outlived many non-smokers. I don’t think that’s an argument to take up smoking. The fact that you met someone that may have been exposed to high doses of damaging radiation and got through it is not some kind of vindication…..unless you have the ethical and pr skills of a tobacco company. Are people (some of them) on this site suggesting now that the evacuations ordered by the Japanese governments are simply an emotional/hysterical response to the nuclear accident? I must have missed where it was suggested that the evacuations were an amotional/hysterical response? I suppose it depends on the type of work they’re doing, where they’re doing it (e.g., how close to a source), how long it takes, and where they are able to wait. All of those things seem rather difficult to say conclusively, or even speculate on, while sitting in front of my computer half a world away from the event. Indeed, this is the source of my musing on what kind of dose the workers are receiving. I’m not really into this whole “armchair general” thing, I just ask questions (and try to answer them when I can). @Jim Andrews – Yes, I am saying that the evacuations are an hysterical, dangerous response to a nuclear incident, especially given the extremely hazardous shelter, food and water situation following the earthquake and tsunami. Hydrogen is produced, when the outer shell of the fuel rod (zirconium) reacts with steam/water. It can be produced either in the SF pool or the reactor. There has been massive amounts of hydrogen produced and one of the main issues past couple of days, has been the proper venting the Hydrogen. After dealing with the multiple hydrogen explosions that occurred in the reactors, how on earth could you miss that? This link you provided me did not give me the most current reading for reactor 4, it was clearly reactor 3. Also, why did you change the values from miliverts to milirems? Reactor 3 was 4.13 miliverts, which you listed as 410 millirems. But then you said the measurement was for Reactor 4. I remember the last reading Reactor 4 took was roughly 410 milliverts, that would actually be 41,000 millrems. That’s a tremendous amount of radiation put out by exposed spent fuel rods. 410 milliverts and 410 milirems sort of look the same if you’re not paying attention. Ron, I find this troubling. At worst you’re being dishonest, at best sloppy with your facts. Either way, it appears you have an agenda . I’ve recommended this site to a lot of people as reasonable and fact based because the previous few days have been, so thanks for writing it. However, THIS “guest post” with its speculation that the spent fuel ponds on 1-3 are empty comes out of nowhere and smacks of denialism and it hurts the credibility of the previous posts as well. As the link Tomas provided above (http://www.jaif.or.jp/english/news_images/pdf/ENGNEWS01_1300322727P.pdf) JAIF is clearly concerned about the water level in the #3 cooling pond. Also, the helicopter drops and currently planned (possibly now underway) water trucks are targeting #3 for this very reason according to the coverage on NHK hours ago. Also the same pdf along w/ the concern about cesium etc in the steam, strongly suggest that the seawater is being pumped directly to the core. Can you edit the entry and just remove those ports and/or or put an in-line clarifications ? i REALLY appreciate these entries the past few days, but this one is just highly implausible and hard to defend. Do you have any nuclear training or operational experience or are you simply an interested observer? Think hard about the geometry of a helicopter that is 1000 feet over the Fukushima Daiichi power station and then goes down to 300 feet. Do you really believe there is any way that a measurement reported as being over unit 3 will be much different from one that is reported as being over unit 4? Have you seen photos of the station to see just how close those two buildings are? The report that you are quoting probably came from a source that mistook milli for micro. What the heck, for a journalist they look pretty similar – but they are a factor of 1000 different from each other. What would you rather have for your annual salary 10,000 or 10,000,000? Yes, I make no bones whatsoever that I have an agenda. I want to help make the world a better place for my children, grandchildren and their grandchildren by helping us to move from a hydrocarbon based economy to a heavy metal (uranium, plutonium and thorium) based economy. Hard to say, specifically. I would say it’s the release of fission-product gases (Xe and Kr) from the fuel assemblies as they are heated to abnormally high temperatures. I would say it’s mainly from the reactor(s), not used fuel in the storage pool. There’s a useful little piece of information. Thanks for that. That does seem like a rather long maintenance and/or fueling outage, doesn’t it? To re-express that in a perhaps less cynical way – I absolutely agree that we need to keep this all in context with regards to the terrible tragedy and destruction across Japan. No. This is the intrinsic amount of energy that is being emitted by the radioactivity in the nuclear fuel. These figures have nothing to do with what kind of cooling is or isn’t working. However, to figure out the temperature that the fuel will rise to, you’ve got to look at how much power generation there is from the radioactive fuel, and how that power is being dissipated, which means looking at the cooling mechanisms that exist. That’s an extent of core melting that is the worst case imaginable, complete liquefaction and melting of all the fuel, and I don’t think it’s realistic. That’s a scenario far, far worse than Three Mile Island, for example. Remember that the energy being generated by the radioactive fuel is constantly dropping and dropping every day as it decays. Even if you imagine that the used nuclear fuel could get through the reactor pressure vessel, which isn’t realistic, there are still multiple other layers of containment – including the massive concrete primary containment structure that is immediately surround the drywell – that it has to get through before it can potentially hurt people. I’d like to see a good photograph of that. Does anyone know where to find one? Got any source material or anything to back that up? Yes. Everybody here knows that. Standing near used nuclear fuel which is not contained in any water or any other kind of shielding is extremely bad for your health. The people working at Fukushima know that. This is not any kind of novel information. And it’s not particularly significant. If the used nuclear fuel is exposed without water present, the people at Fukushima won’t be standing near the fuel transfer pool. Thanks, that’s good information. OK, we know that there certainly is fuel in the pool. And we know exactly how much there is, how old it is, and how hot it is. I wonder how long they hold they fuel in the reactor’s on-site pool for prior to transferring it to either the main fuel pool on the site (outside the reactor buildings) or into dry casks. Obviously that post was written several days ago. We all know that this situation has been developing and changing quickly, with information becoming “outdated” rapidly. OK, the information at the present time does show us that there is at least one full core load of fuel in the pool at this time. It’s OK to say, in a polite sensible way, “Luke, actually that appears to be wrong and here are the details”. I appreciate that. I welcome it. Peer-review and sensible, constructive corrections and updates to the information that we post (Barry, myself or any other commenter or poster) are all very valuable and important. Constructive, sensible comments that review or correct or provide updates to the information somebody else has posted are all important. We’re all working with limited and imperfect information here, trying to collate and filter all this information into a picture of the situation which is consistent and accurate and sensible, in a situation which is developing and changing rapidly. Many hands make light work, as far as achieving this is concerned. I spoke with an old friend yesterday. I cannot reveal his name, but rest assured, he is in a position where his information is extremely reliable. He told me that the response center at the US NRC has no source of information on the ground that is any different from what we all have access to on the web. There is no reason to believe they are especially well informed. If you watch Dr. Jaczko’s testimony on C-Span, you will hear him using “We believe” and awful lot, and you will not hear him claiming any specific source of information. In this house, we obey the laws of thermodynamics! I never said the pools shouldn’t heat up. Of course the fuel is releasing energy. But releasing energy at what rate, into how much water? I don’t understand this seawater business completely. Perhaps you can explain it to me? We know that seawater injection is occurring into the reactor containment vessels at certain reactors – but that’s not to say that it may not be into the reactor pressure vessel too. But given the damage it will do to the nuclear steam supply system, that seems to me like it would be an absolute last resort – and I do not yet actually have a good understanding of why you would resort to that. Most of the components of the ECCS – the HPCI, the RCIC, the LPCI – are designed to work in station-blackout conditions. Have RCIC and LPCI actually failed at all these reactors? If so, I’m curious to actually find out how. LPCI is designed to, in the event of a severe design-basis LOCA, supply plenty of water to the core continuously over several days while the fuel’s decay heat drops away, until cold shutdown is reached. Even if, through some mechanism that nobody has yet elucidated to me, LPCI is not functional, there is a very large amount of fresh water stored in the system which is used to actually supply the LPCI water. Even if the actual LPCI pumps aren’t running, why can’t that water be pumped in instead of seawater? The design basis really doesn’t have anything to do with the earthquake magnitude, because it depends on how far away the earthquake is, and how deep it is, as well as it’s magnitude. The earthquake design basis is based on the peak ground acceleration that could occur, as measured at the plant site, under earthquake conditions. What was the actual peak ground acceleration measured at Fukushima? What was the design basis? These are good questions, I would like to know. Good question. Why is the boron needed at all? There is no fission going on at all. No fission can occur in the reactors. They had all the control rods fully inserted normally, during the initial SCRAM at the time of the earthquake. Even if you melted the entire core into a pool of molten corium on the bottom of the reactor pressure vessel, that pool of molten uranium oxide and zircaloy and molten control rods wouldn’t be critical, especially without the neutron-moderating water that is required for the LEU to reach criticality. The used fuel in the pool can’t reach criticality, either. The used-fuel storage water is normally borated, and it’s in a subcritical geometry. If the water in the pool evaporates, the boron is only concentrated. If all the water was lost, you’re removing the moderator, so there will be no criticality in that scenario either. Maybe it’s just standard operating procedure in these plants that all emergency coolant injection has boron added to it, as a routine procedure, just to be extra safe and conservative? This certainly makes sense. I’m sure it is one of the key considerations that will come out of this incident for all future nuclear power plant build. Good analogy. I have no doubt that people will be taking a long hard look at design and construction in the nuclear energy industry now. And just like with SUBSAFE, something that is already quite safe will be made much safer. I just hope that irrational political pressure doesn’t put an end to the whole submarine force, to use your analogy. As I understand it, HPCI is driven by steam from the nuclear steam supply system, but it can only be operated for a limited amount of time following shutdown, because the decay heat power output isn’t enough to raise enough steam. This was the first i saw this document at all. Good timeline there. Looks like among the workers there have only been two severe casualties, which is 2 workers still listed as “missing” in the unit 4 bldg for almost 2 days now. (i hope they’re ok, but seems like a longshot). @Steve Gardner, et. al. Your basing your reasoning on the supposition that there would be greater long-term impacts from a worse-case event at a nuclear plant, than at any other facility. This is categorically and demonstrably wrong. As I alluded to in my last remark, even Chernobyl did not seriously effect the surrounding countryside, even though a graphite fire is the most ideal way of generating, and broadcasting radioactive contamination, short of an atomic bomb. The fact is that both the short-term, and long-term consequences of loss-of-containment event at a nuclear reactor have been blown far out of proportion by governments and the media. While the former had some excuse, in that there was little hard data available, forcing them to consider worse-case predictions based on poor models, it is high time these were reevaluated in the light of real-world observations. The RPV is the reactor vessel itself. This bit is new news to me. The PCV is the containment vessel – and this information is consistent with what I originally posted. It has been reported that they’re actually doing it, and possibly also injecting into the reactor pressure vessel at one of the reactors too. If you don’t have a good understanding of why that’s necessary or why that makes sense, well, you and me both. I thought this kind of thing was all supposed to be handled by normal ECCS operation, anyway. Initially, HPCI is used while the core is still under pressure, and then if HPCI can’t do the job and LPCI is required, the RPV is depressurized, if it is still at pressure, and the pressure is maintained sufficiently low that LPCI can keep running water into the core. “A reader at the MITNSE blog provided this link to a TEPCO slide presentation of 16 November 2010 PDF). Slide 9 shows the status of the spent fuel pools and the separate on-site longer-term storage facility. Thanks. We now have a good, clear understanding of how much used fuel there is here, and the fact that most of it has had several months of decay already. Of all the people, perhaps on the order of ten thousand people, who have tragically lost their lives in this earthquake and tsunami, who have lost their lives in a disaster completely unrelated to any exposure to radioactivity or ionizing radiation, one of those people was on-site at the nuclear power plant. It won’t melt. How hot will it get, in air? It depends on how long the fuel has been cooling for, and what its decay power is. Should be quite straightforward to actually plug the information into the right software and get concrete numbers, assuming actual uncovery of the fuel in the pool. In the absence of water cooling, I think it’s plausible that it could get hot enough for a release of some of the fission-product gases, i.e. radioisotopes of Xe and Kr, though. But most of those short-lived fission products have decayed already, so the inventory will be quite limited, except for the ones with half-lives that are a bit longer but have less specific activity, eg. krypton-85 in particular. I’m really not concerned much with what the dose rates are in the plant itself. The men and women who work there understand dose rates and health physics quite well. They routinely work in areas of elevated above-background dose, and they know how to work safely in those environments. They understand how to measure and quantify the radiation field in the working environment, and the accumulated doses that they’re personally receiving. They understand how to manage shielding, exposure time, radiation measurement and dosimetry in order to get the work done safely and effectively. Even with abnormally significantly elevated radiation fields in some areas as a result of these incidents, they still know how to work safely. If the radiation dose rate in some particular area is so highly elevated that it cannot be entered safely for any length of time at all, then they won’t be entering it. I’m much more interested in off-site dose rate measurements, personally, as those are the measurements that are actually of relevance to the public. For this to occur, the fuel assembly needs to be in water. If there is no water this cannot possibly occur. Furthermore, the fuel assembly needs to be at an extremely high temperature for this to occur. This can occur, in the event of active cooling loss, in fuel that has been removed from an operating critical reactor only very recently, since the fuel’s decay heat decays away quite rapidly. The used-fuel heat output is just not that high in this fuel, which was taken offline 3.5 months ago. This kind of reaction will not occur, based on the fuel-pool temperatures that are being reported. “Most of the components of the ECCS – the HPCI, the RCIC, the LPCI – are designed to work in station-blackout conditions. Barry actually has a post in this very blog that shows the most recent report (and he keeps it updated). It is my understanding that this is exactly what is not true: they are using seawater because they do not have fresh water and they cannot be resupplied. I agree. I’m no expert but I believe that even if there’s a total core meltdown followed by an explosion that destroys the containment vessel, stuff would be thrown a few hundred meters up but there would be no long term fire to bring it further up as in Chernobyl. Also I believe the real danger for people is not going to come from direct exposition. It’s going to come from water and food. And this is something that can be controlled. Of course “can be controlled” does not imply “will be controlled”. That’s why I wrote that this is no Chernobyl (even in the worst case) unless we make it so. Many thanks Luke for taking the time to go through all these comments. I certainly appreciate your efforts and all those of the other contributors also. so its confirmed that there are people on this blog that think the Japanese governments request for people to evacuate is emotional/hysterical. I’d suggest that you are living in a degree of denial of the situation. And to the extent that Luke Weston has acknowledged that his earlier sunny statements on the severity of the incident were completely wrong, that’s appreciated. Perhaps the nuclear booster side of the argument could do what they are suggesting to others and reduce the slightly hysterical edge to their apparent desire to insist that all is OK continually and as has been said wait for the facts before pronouncing this as some kind of victory for nuclear energy. Its starting to sound a tad strained. @Jim – I am not living in a state of denial. I have been studying and practicing my nuclear knowledge for 30 years. I know far more about the subject that most people alive. I know that sounds incredibly arrogant. Sorry. The fact is that panicking about minor amounts of radiation in the face of a huge natural disaster is putting a lot of lives at risk. The nation of Japan needs food, water, and shelter. It does not need to waste resources on actions at an industrial facility that are challenging for the workers, but not putting anyone at risk. I am staking my reputation and my career on being correct with my analysis. @Rod. Sorry Jim but what you are saying is that you know better than all the authourities tasked with actually ( as opposed to theoretically and virtually) dealing with this incident. Those authourities, unlike you, have to deal with potential real risks rather than textbook optimistic possibilities. I am just suggesting that people should enterain the idea that they might be wrong, I’m happy to do that on my side, you seem to be locked in a kind of dogmatic trench warfare due to your faith in the technology. I think neither us can afford dogmatic positions in this. The reality on the ground is that this nuclear accident is making a shocking tragedy far worse for many people. We are all hoping its fixed soon, but the repeated over optimistic opinions and statements of the incident’s triviality on this site are not grounded in reality. fp: With the water moderator gone, the reaction (if any) will slow down if anything. I must be missing something here.. Why is this a concern at all?? Yes. You know nothing about nuclear reactions or power. Your own sentence explains it – “moderator” means to slow down. “accelerator” is the word you need for your argument to make sense. Without the water moderation (let alone cooling) the reaction will speed up, and things will get hotter. On a different note: on the 15th it was at 84 C. That’s not a very scary rise in temperature, considering the fuel rods melt at 2000 C.
84C is not far below where water boils (100C) and after it’s gone there’s not moderation and the heat will go up until it reaches an equilibrium with distribution to the surrounding environment. If that distribution is only air – well air is not a great conductor (without significant significant circulation) else your car would be a Volkswagen and not water cooled. This is a basic principle of thermodynamics. There are too many people on this site who have no – read zilch – understanding of basic physics. if the cross-section doesn’t drop away as rapidly as you increase the incident neutron energy, for 239Pu as compared to 235U, then you might see a negative void reactivity coefficient that isn’t quite as strong. Stuff like that. That is not a very usual use of the term cross-section and it turns the phrase into meaningless gibberish. A cross-section is a probability, not a magnitude. It doesn’t matter what the input intensity is, the cross section remains the same. Or if perhaps another, non-standard usage is intended perhaps Luke could explain. What are the implications of this level of radiation? @Jim – do you have a link? Are you sure it was milli and not micro? @ Rod- that was sourced from the Guardian newspaper so no I’m not sure, you’d have to check their source. Meanwhile just acknowledging that Barry has posted the below statement on another part of his blog and would appear to disagree with some posters now on the potential seriousness of this event. The acknowledgement that his prediction of the seriousness of the event being severly underestimated by him is welcome. It seems that fp and JM are both confused. The moderator in a reactor is for slowing down the neutrons to make them more likely to be absorbed. There is no “moderator” in the cooling ponds because there is no sustained chain reaction going on. The point of the surounding water is simply to cool and shield. “That is not a very usual use of the term cross-section and it turns the phrase into meaningless gibberish. “Intensity”, as in, say, the intensity of a beam of neutrons, is not the same thing as the energy of those neutrons. Intensity, in this sense, is like a measurement of the particle flux – and you’re quite right, a cross-section for a particular nuclear reaction does not depend on the flux or intensity of the incident particles. You have gone through the thread, and responded in three or four recent comments of your own. There is some information at variance with what you wrote in the original post, that you have acknowledged. It would be helpful for this site if you would write a (timestamped!) Update to the original post, clarifying the major points where your original analysis was incorrect. Most readers will not work through a long thread to discover your remarks, as they stand. They will be left with misunderstandings. “fp: With the water moderator gone, the reaction (if any) will slow down if anything. I must be missing something here.. Why is this a concern at all?? Actually he sounds more knowledgeable than you. In a reactor the role of a moderator is to slow down the neutrons. Fast neutrons are unlikely to cause fission, slowed down neutrons (aka thermal neutrons) are much more likely to do so. Remove the moderator and you have a less energetic reaction (or none at all). “84C is not far below where water boils (100C) and after it’s gone there’s not moderation and the heat will go up until it reaches an equilibrium with distribution to the surrounding environment. If that distribution is only air – well air is not a great conductor (without significant significant circulation) else your car would be a Volkswagen and not water cooled. This is a basic principle of thermodynamics. Eventually there is someone with an understanding of basic physics that believes nuclear physics is as simple as thermodynamics. Remove the water and you remove the moderator. If there was a chain reaction, this would slow down, not go up. But there’s no chain reaction: only decay (of both actinides and fission products, but fission products are the ones that generate the most energy for the first 45-50 years after the chain reaction has been stopped). Therefore the absence of the moderator does not influence heat generation. However without water there is less cooling implying higher temperatures. The zircaloy will oxidate. The higher the temperature the faster it oxidates. It can oxidate in steam or just in the air (as long as there is oxygen, of course). If it happens in steam hydrogen will be a by-product (in large quantities). Zircaloy oxidation (both in steam and in air) also generates A LOT of heat in and by itself. While the zircaloy will only melt at 1850°C, the oxidation process can become self-sustaining at much lower temperatures (I’m not sure, I think around 1000°C). I do not know if it is possible to reach such temperatures in those pools and risk a “zirconium fire”. Even if it cannot happen as soon as the rods are not covered by water, the strongly exothermic nature of zircaloy oxidation itself will start adding heat. During the earthquake, I think that the facility suffered over-design levels of ground acceleration (is that certain?). Since then, there have been explosions and fires near some of the four SFPs. Figure 20 in the original post shows that the Mark I design has the SFP located near the top of the secondary containment. It is not at ground level. Taken together, a simple explanation is that some of the SFPs may be leaking. The leak would come from broken pipes, or from cracks in the reinforced concrete. Has the presence of leaks been confirmed or denied? If confirmed, are there any estimates as to their scope, in liters/hour? A big leak would seem to require a major change in strategy, as that would make it impossible to re-fill an SFP. Which is worse, assuming some fuel rod cladding is already damaged and that the rods have lost their integrity: having fuel rods in the SPF go dry and overheat? Or spraying water on them, which turns to billowing steam on contact, possibly entraining heavy radionuclides like I, Cs, and Sr, and carrying them into the atmosphere? @AnalogFile – Even in the very worse case that could possibly occur here, the food chain will not be effected, and nether will water supplies be impacted in any meaningful way. The mobility of the radioactive products, and their lack of solubility will keep them from spreading. I would simply request that all statements in any ‘expert’ update/information step in this episode properly accept and give weight to the fact that much is unknown about where we are, how we got here, and what can happen next to each component given that the plant and its parts are now operating so far outside off normal or modelled status, so far away from operator experience, and that the cruel world out there has a habit (a particularly vicious habit in this case) of shifting the sand on ya.. A healthier respect for the as yet ‘unforseen’ please…in an otherwise really useful update. Thanks. What if the next earthquake is magnitude 10? Magnitude 12? Magnitude 20? But where does it stop? Where do you set the design basis? What if the reactor is attacked by Godzilla? Considering the number of major earthquakes with tsunamis japan has had in living memory the only appropriate reply to a statement like this is vulgarity. So am I to understand that you stop the reaction in a reactor by removing the cooling rods???? That in an earthquake you should lift the rods out of the reactor rather than drop them in? You guys are in fantasy land. And as regards heat it is relevant. Go and get a saucepan, fill it with water, attach a thermocouple and put it on your stove. Plot the temperature. The temperature will rise to 100C where the water starts to boil. It will then stay there and not move until all the water is gone. At that point the temperature will start to go up again until the pan melts and starts to burn. That’s what they risk happening with the fuel rods in those ponds. – why are these rods put in water in the first place? – why does it become so dangerous to go near them if there is no water? JM, I don’t understand the point you are making. There is no such thing as cooling rods. There are control rods, which are strong neutron absorbers (usually boron/cadmium). And I think the folks were talking about the possibility of recriticality in the SNF ponds, not the reactors. Hence the discussion about the water acting as a moderator. I think you are missing the point about how moderation works. Inserting control rods stops the reactor by displacing the moderator – that is, by removing the water between the fuel rods. The water _is_ the moderator. The control rods are _not_ the moderator. The counter intuitive thing about nuclear reactions in this kind of reactor is that they rely on slow neutrons whose speed has been moderated by interaction with H2O. This differs from fast reactors where fission relies on fast neutrons. I think if you take the time to understand how neutron moderation works, you might not be so mystified by the points being made here. Safety and Security of Commercial Spent Nuclear Fuel Storage. The report discusses cheery topics such as propagating zirconium cladding fires and the possibility of the rods becoming critical. You want to keep it firmly in your mind if you read this thing that the panel clearly stated no one asked them to rank the threats they discuss compared to anything, i.e. the rest of what could happen in the US as a result of terrorist attack. They were charged with considering “what if” and that’s what they did. Although they said: “Additional analyses are needed to understand more fully the vulnerabilities and consequences of events that could lead to propagating zirconium cladding fires”, they could not “dismiss” the possibilty and recommended rearranging spent rods in the pools and adding water spray systems that could cool the rods even if “the pool or overlying building were severely damaged”, by terrorist attack. They did sort of dismiss one theoretical possibility: “The committee could probably design configurations in which fuel might be deformed or relocated to enable its recriticality, but the committee judges such an event to be unlikely”. I discussed spent fuel pools in this TEC post.. It proved to be very controversial which is apparent from the debate in the comments and the stature of the pro nuclear advocates who engaged. BTW, Eastern Washington state is often mentioned when the subject of relatively high background radiation levels comes up. Spokane, a small city out east is said to have 5 times the level normally found in Seattle. My impression is its above 1500 rem/yr. People from Denver have to come up here if they find they aren’t glowing the dark strongly enough. It then goes on a couple of sentences later to discuss the advantages of heavy water, but “light” aka ordinary water is definitely a moderator. You don’t know what you’re talking about. The behaviour of atoms and molecules isn’t changed (much) just because the atomic weight changes. And if you think you do, can you explain to me why you think a dry saucepan left on your stove won’t burn? The Energy Collective has stated that they are refusing to post my pieces which quote the current thoughts of Ted Rockwell, who is closely monitoring reports from Japan. Their first attempt at an excuse is to explain that it is redundant to hear what someone like Ted has to say in the light of what’s happening at Fukushima because they’ve already published my piece quoting Ted from a Science article he wrote in 2002. No one could possibly be interested, they are pretending, in the thoughts of someone who was the Technical Director of the program that built the first commercial nuclear reactor in the world, about how great a threat the reactor problem in Japan can evolve to be. Just to illustrate my point that it is getting very weird out there. > Spokane, a small city out east is said to have 5 times the level normally found in Seattle. My impression is its above 1500 rem/yr. David, don’t worry, I shall post it in the morning. Sea water is pumped into the pressure vessel (as well as into the first containment). @JM – good grief! where on earth did you learn nuclear physics, or thermodynamics for that matter? A possible explanation for the generation of hydrogen in the SFP. The water temperature is normally 25C. Cooling will take place by natural convection under normal circumstances. if the temperature rises to 84C natural convection is not that effective. you may get film boiling on the zircalloy tube surface. local surface temperatures may rises sufficiently to cause oxidation of the zircalloy and consequent generation of hydrogen. You can eventually burn/fuse the element in your kettle in this way? You might like to see the other comment I recently posted on Barry’s other thread above, regarding evaporation/boil rate in the pool. But when you look at the videos you see water levels on buildings much higher than six feet above the ground around the building. How well do designs capture the observed behavior of the ocean? Does anyone know the tide level at the time the tsunami hit Japan? on the west coast of N. America the tsunami hit at low tide — the people at the affected ports were quoted as saying the water would have been six feet higher at ‘high high’ tide. This seems quite inconsistent with the before-and-after satellite images of the complex. The tsunami swept away the backup generators, tanks, small outbuildings, cars, and equipment. It reached well inland from the reactor buildings themselves, and flooded their basements. It apparently fouled many of the plant’s intakes. I find it hard to understand how a sea level rise that is 70 centimeters higher than the design criteria could accomplish all that destruction. Were the waves and sea level rise at this location much higher than the 7 meters cited here? Or, did the “designed to 6.3 meters” claim refer to something non-obvious, e.g. “a 6.3 meter tsunami that arrives at low tide”? JM, you are confused about what a neutron moderator does in a nuclear chain reaction. Fast neutrons (no moderator) means the neutrons (mostly) escape the reactor vessel without hitting any (many) fissionable atoms and the reaction slows and stops. Hank, if you read the article it says they are looking for an inland site for that plant. My concern is — are these kinds of decisions on these coastal sites being made by the same people who flat out refuse to consider the “worst case” projections we have for sea level rise? The quake struck at 14:46 JST. IEEE Spectrum’s timeline says the generators failed at 5:41 JST. > timeline says the generators failed at 5:41 JST. Hm, other reports say the tsunami came an hour after the quake and the pumps stopped then, with loss of outside power, and the generators failed after that. I’d bet “5:41” is a typo. Any other cite? Typo … IEEE Spectrum’s timeline says the generators failed at 15:41 JST. Dunno. I’d guess that means the waves came over the sea wall; once that happens a seawall is a liability if it survives, because it keeps the water from running back out. And there are multiple waves, not just one. “… In the previous two days the temperature of unit 4’s pond had been 84ºC but no more recent data is available. At these temperatures cooling by natural convection begins to be markedly less effective. Normal operating levels are about 25ºC. There was no information on the temperature of the pond at unit 3. Anyone know more about the actual temperature measurements? Location of sensor(s); whether we’re getting an average of readings taken at intervals over time? If a sensor is above water level, it’s getting an air temperature rather than a water temp., and the outside air in the area is around freezing — it’s been snowing, and there’s some wind blowing through, as the photographs of steam coming out of Unit 4 show. A steam cloud in cold air necessarily mean the water is at boiling temperature, which gives some hope yet. If the outside temperature drops below freezing, the air will be dryer as water freezes out, enhancing evaporation from the pools. I wonder if a crane could get close enough with an infrared thermometer to get temperature readings. Or one of those little remote control helicopters used to carry in a thermometer — if anyone has such that can stand the radiation environment. Remembering this is a “tidal wave” — prolonged, like a high tide event not a high wave like from a storm — the water stays high for a long while and would continue to pour in. Well we’ve all seen videos by now of that happening. So a “70cm” water height above design criterion is a complete failure. Alas — revisiting the Gen2 design criteria _is_ needed! “… In January 2011 a report from the State Council Research Office (SCRO), which makes independent policy recommendations to the State Council on strategic matters … cautioned concerning provincial and corporate enthusiasm for new nuclear power plants and said that the 2020 target should be restricted to 70 GWe of new plant actually operating so as to avoid placing undue demand on quality control issues in the supply chain. Another 30 GWe could be under construction. … ambitious targets to deploy AP1000s with reduced foreign input had proved difficult, and as a result, more of the Generation-II CPR-1000 units are under construction or on order. Only China is building Gen-II units today in such large numbers, with 57 (53.14 GWe) on the books4. Seeing official acknowledgment about ” placing undue demand on quality control issues in the supply chain” is somewhere between eye-opening and hair-raising, given this is China, a government operation, and the ongoing series of reports about disclosure of failure of quality control on, for example, big concrete construction projects that have collapsed. I often remark that many American nuclear regulatory personnel are on-site, as they should be for all large energy facilities that are more likely to do harm if the regulators don’t care. But I know nothing about whether this wise arrangement exists in other countries, even my own. So, does it? In Japan, in Canada, or in any nuclear power country for which you happen to have that knowledge? Ok Hank, fair enough. I don’t really like any kind of PWR in any case. The AP1000 claims to have a lot of passive safety features, but they look pretty complex. I like the simplicity of the liquid sodium IFR. Linked to an article about it halfway up this thread. The problem as I see it is not tsunamis. It’s the need to provide active cooling. There are all sorts of situations where the pumps might stop for some reason. So let’s skip Gen III and build Gen IV. > So a “70cm” water height above design criterion is a complete failure. I suspect the gap between the actual tsunami-resistance capacity of the Fukushima complex (as it stood on 11 March) and the actual height of the tsunami was much more than 70 cm. From the look of the satellite pictures, this tsunami would have been disastrous for operations, even if it had been a meter lower. Two meters? Lower still? The force of the rushing water around the reactor buildings was obviously great, considering the damage it did. And it didn’t stop one critical aspect of plant operations, but multiple elements. yes yes millirem. Some prospecting for uranium has been done in the region, a bit north of Spokane ijust across the border in Canada where at the surface there are far higher readings, according to a prospector I met. The Canadian provincial jurisdiction controlling whatever is there put a moratorium on uranium prospecting some decades ago as they have very large hydroelectric resources. There is no such a thing as a cooling rod. There are fuel rods and control rods. The cooling does not come from any sort of rods. Neutron moderation may, in principle, come from some sort of rods (graphite tips in Chernobyl control rods had this effect when they became stuck), but in BWR reactors both cooling and neutron moderation is provided by water. You drop in the control rods. This shuts down the reaction by removing most of the neutron moderation provided by water and, on top of that, absorbing fast neutrons (the control rods are neutron absorbers, not neutron moderators). Are you talking of the fuel rods in the working reactor core, a shut down reactor or the spent fuel rods in the pool? – water acts as a coolant, you need to cool the fuel rods to prevent damage (zircaloy oxidation or melting depending on temperatures). – water acts as a shield to radiation (especially important in the pools, less so in the reactor). Because they are highly radioactive. What you really seem not to understand is that water is a proton moderator when there is a chain reaction. If the chain reaction is stopped there is no proton moderation whatsoever and water is just a coolant and radiation shield. Radiation from fission products decay is mostly alfa, beta and gamma. In the pools water acts as a shield for these (as well as being a coolant). There is no proton moderation here. Which is correct. There is no chain reaction, but if the fuel rods were to go critical (for some inexplicable reason) the absence of water would in fact slow down the reaction (actually I believe almost stop it, in comparison to the levels of a working core, even if the rods were not spent fuel but new ones). You still seem to misunderstand the term “moderation”. Water has two different effects within a reactor core: one is thermal, one is nuclear. The thermal effects of water do transfer heat from the core, such as water in a pot transfers heat from the stove. On the other hand, water also has nuclear effects. It affects the fission process by slowing down the neutrons and making fission more likely. The presence of any kind of moderator, water or otherwise, will cause the fission process to release more heat than it would otherwise. The term “moderation” does not refer to the thermal effects of water removing heat from a hot core. It does refer to the nuclear effects of slowing down neutrons. By enhancing fission, this has the effect of heating up the core, but only if a fissioning process is under way. So a more effective “moderator” will cause a fission process to be more effective and therefore release more heat. You really need to understand that “moderation” is refering to the nuclear effects of water and not the thermal cooling effects and that these two effects are quite different. Can anyone point me to an explanation about why the material released from molten fuel rods cannot go critical? Yes, fission of a contiguous mass will be less effective than fission of discrete masses moderated by water, but what actually prevents criticality being achieved anyway? Jon, the cross-section of the fissile material (the ‘area’ the neutrons have to hit) is greatly reduced in the absence of water (since the neutrons are fast), and the neutron loss is very high in a low-enriched, ungeometric situation like this, such that a sustained chain reaction is impossible (more neutrons are lost than are regenerated via fission). I think I understand how this occurs – slower neutrons have more targets to hit. In a normal fuel assembly what factor does the presence of water increase th e cross-section by? Could abnormally high volumes of material that have pooled together increase the effective cross-section or do 3D packing considerations mean this isn’t a problem for realistic contiguous masses? I can tell you that here in Spain there are at least two resident inspectors from the CSN (Spanish Nuclear Security Commission) in every nuclear power plant. posted 19 March 2011 at 4:43 AM by Jose A.
Fukushima 1 was built just one decade after the 9.5 magnitude Valdivia earthquake, which caused tsunamis over 25 metres. These tsunamis reached Japan at the time. Yet they only designed the Fukushima facility for a much, much lower 8.2 magnitude earthquake rating. Why could they not even design this plant to meet an earthquake/tsunami scenario that had occurred just a few years previously? Why did they design such appallingly inadequate contingency cooling systems in the face of this scenario? If it wasn’t cost, what other reasons? Blind optimism? Over arrogance in the face of prudent risk analysis? Lack of humility to the possibility of failure, perhaps ? An inability to take on constructive criticism? You are talking nonsense. Have you heard of nuclear bombs? I wasn’t aware they needed water – or indeed any form of moderation – to achieve criticality. At the School of Physics for a major university, where did you learn yours? JM – if you don’t have a moderator, you must have a much higher % of fissile material. Oh, and stop with the ad homs or you will be put on moderation. This discusses _transport_ of assemblies of spent fuel rods — and the sort of considerations used to model and assess the chance that a transportation accident and/or fire will lead to a critical assembly (and thus, what to avoid in packing the stuff up to put it on the road). These folks sure do have a lot to think about. It ain’t simple. > let’s skip Gen III and build Gen IV. Yep. I suggested a year or two ago that IFR should stand for Improved Fissionables Reduction — sell them as a way to burn up the piles of ‘used’ fuel. Set’em up next to coal boilers and eventually switch to them as an alternative heat source. They’ve already got the railroads, the huge yards to store material, the generators — just replace the coal burner with a relatively small Gen IV heat source. Give the coal companies money for the amount of radioactive fly ash they will no longer be putting into the air and the waste piles– buy’em out as an explicit way to end the biggest source of heavy metal and radioactive material going into the environment “grandfathered” right now. Mine the fly ash for its fissionables. Instead of deregulating fission, bring the fossil fuel sources up to the same level of care. And do the research comparing health effects properly. As they say about carbon dioxide, if it turns out later on that we actually need more of it in our environment, that’s easy to make happen. But if it turns out we do have enough already, or too much, we’ll be glad we throttled it sooner than later. Hank, spent fuel both commercial and military, along with weapons grade material, has been transported all over this nation and Russia/USSR for many decades now. Why in the world are you providing links to the Russian ships where it’s not even reporting problems with handling the nuclear material, but with red tape and even not having as many cranes available so they can offload faster? And then a hypothetical plume travel bit of research that doesn’t even say if there is a mechanism to get the release they’ve used to run their computer model? And you present this as something to be really afraid of? Come on man, get real. Yes Barry that is true, but fast neutrons can still cause fission which is quite opposite to the statements you were making. And what ad homs? sunake had a go at me, I replied – politely I think. Please make sure you adhere to these to avoid your comments being deleted/edited. Comments Policy — I welcome comments, posts, suggestions and informed debate, from a wide range of perspectives. However, personal attacks, insulting/vulgar posts, or repetitious/false tirades will not be tolerated and can result in moderation or banning. Trolls will be warned, and then disemvowelled. Civility – Clear-minded criticism is welcomed, but play the ball and not the person. Rudeness will not be tolerated. This includes speculation about motives or what ‘sort of person’ someone is. Civility, gentle humour and staying on topic are superior debating tools. Relevance – Please maintain focus on the topic at hand. Do not attempt to solve big problems in a single comment, or to offer as fact what are simply opinions about complex matters. Disclaimer — The views expressed on this website are my own or my contributors’ and do not necessarily represent those of the University of Adelaide or the Government of South Australia. > And what ad homs? > You don’t know what you’re talking about. > You are talking nonsense. Fissionable nuclei look a lot smaller to fast neutrons than fissile nuclei do to thermal neutrons. This means a fast neutron has to travel much further to encounter an opportunity to split a fissionable nucleus. Yes, I know that Finrod, it’s the definition of cross section. But a point and a question. First you are confusing (I think) the neutron capture cross section and the total fission cross section. Second a question: What do you think is happening in a fast reactor, which by definition is unmoderated? The first one was in response to someone who claimed water was not a moderator, but now I’m being berated by all and sundry for a.) pointing out that it is (and is in fact used as such in BWR like those at Fukushima) and at the same time being told that I’m “wrong” in some totally undefined way while people also accept my point. The second one was in response to Barry’s use of the term “cross section” (which in my view he doesn’t understand) to claim that fusion was impossible without a moderator. Which is something he’s definitely wrong about. You don’t seem to appreciate the implications. I believe that fast neutrons are collising with fissile and fissionable nuclei and fissioning them to produce great amounts if heat and new liberated neutrons. I also understand that the process requires a much greater amount of fuel than is found in a light water reactor, because of the issue I mentioned above about the much longer travel path of the neutrons before a likely collision. And the presence of anything significant in the way of light elements will moderate the neutrons enough to stop the reaction. Yes, they slow down neutrons, but that actually acts to enhance the fission reaction, not slow it down. Finrod: You don’t seem to appreciate the implications. Why not? I think I do actually, but perhaps if you could be a little more forthcoming about your concerns I can address them. Same as above, more detail please. We’re not talking about a light water reactor. We’re talking about a storage pond where there is no cooling, fires have occurred , there is a possibility of meltdown and whether or not development of a criticality in such a situation is possible. I, and many other people – including TEPCO and the Japanese government – are worried about this. It’s up to you to explain why you are not. You do seem to be awfully confused even about the details of the exchange that has occured between us. You didn’t ask me anything about light water reactors or spent fuel ponds. You asked me a question specifically about fast reactors, and you were answered. When you did not like the answer, you airily dismissed it as ‘noise’. For the life of me, I cannot see how dismissing another’s explanation as ‘[noise]’ can be regarded as civil behaviour. It is just plain rude. Fin, your comment was noise. If you take something like a molten pool of metal then it is the most undesigned thing that I can think of. And getting a criticallity in it is not impossible. There is a large amount of material in a reactor core – well beyond what is required for criticality and there are reports that the storage pond in Reactor 4 contains about 7 cores worth. There’s no shortage of material in other words and arguments based on the efficiency of the process are worthless. Fin, your comment was noise. It’s possible to claim all sorts of things about another’s comments if you completely ignore the actual content. @JM – Let me put this to rest. Fission can occur in reactors without a moderator, it is true. HOWEVER the relative concentration of rich fissile material is very much higher when compared to that required for a thermal reactor. This being the case it can be asserted correctly that no fission will occur when the moderator is lost from the core of a thermal reactor because the enrichment of the fuel will not support it, and note that this must hold true for spent fuel pools for the same reason. Even in a full meltdown, the relative concentration of fissile material does not change, thus there is no risk of continued fission in this case ether. This is in total contradiction of earlier comments on this thread about the profile of the cross-section of U235 and U238 with respect to neutron energy. If we’re talking only about U238 then fission will only occur in a restricted band (but not particularly limited), however if it is enriched with U235 it will occur over a much wider band of neutron energies. This is a well established fact. This statement is nonsense. It is tantamount to saying that either cooling ponds have no purpose or that they are themselves reactors. Rubbish. There is plenty of risk of fission in a meltdown, as well as the more subordinate risks of fire (which has already occurred) and steam explosions. I think they know what they are doing, and the implications. The opinions of people on this blog don’t matter a hill of beans to those people. @JM – I no longer care if you agree or disagree, because it is clear you have no real understanding of the underlying physics, and obstreperously refuse to squire the background to do so. At any rate the rules of the game in science is to prove any hypothesis you are asserting, not demand that others prove you wrong. Therefore I invite you to prove your thesis with the applicable calculations, posted so that we can all see your reasoning. That or stand down as an ignoramus running off at the mouth about something they know nothing about. Jon, I did actually respond to your comment a couple of hours ago. I was quite respectful – I think – but it seems to have disappeared. I don’t know why. In fact, some of the latter part of this thread seems to be missing (yes Barry, I do keep copies of this stuff). DV82XL, I have no intention of posting calculations because I don’t have the data and as far as I’m aware TEPCO are pretty secretive. And in anycase it’s not the way physics is conducted. But the fact is that a cross section is a probability that is mathematically structured in a convenient way to represent the probability of some result happening in a sub-atomic event. It just so happens that when you structure it that way it has the dimensions of an area. That is a classical analogue. It doesn’t actually mean that – contrary Finrod – the target is smaller or larger physically, it just gives you a convenient way to think about it. b.) that the restricted model applicable to a thermal reactor is also applicable to all atomic events – it is not. Please. I await your reply. @JM – First you don’t need data from this event, the general case will do, and the levels of enrichment both in fuel, and in typical spent fuel are well documented. The fact is you cannot because you don’t know how, and obviously don’t know where to start. Again, if you contend that fission can occur in the core of a typical thermal neutron reactor, you should be able to show calculations supporting this hypothesis. If you cannot it is not up to anyone else to prove you wrong. Your demands clearly show that this idea is the product of your imagination, and is founded on a profound ignorance of the physics involved. Ahh. This is not the 1920’s. There are quite a number of commercial reactors around the world doing that right now, as we speak. I don’t have to prove a damn thing, I can simply point to existent implementations of the technology. Fine, if you think that I am more than open to the idea that I may be wrong. But abuse like that in your following sentence doesn’t cut it. @jm – Correction the line should have read: Again, if you contend that fission can occur in the core of a typical thermal neutron reactor, without the moderator you should be able to show calculations supporting this hypothesis. Writing the truth is not abuse. Your statements are nonsense, and demonstrate a total lack of understanding. [ Ad hom deleted]I have explained that the conditions favoring fast neutron fission do not exist because the concentration of fissile material is just not there in the fuel of thermal neutron type reactors. It is just that simple. Now if you can show it is possible by presenting a calculation based argument, I will gladly admit you are right. But we both know you cannot. JM is on permanent moderation after his latest comment (deleted) which violated about 3 different commenting rules. I don’t think he really wants to be here, which is fine. There are plenty of other commenting playgrounds on the Internet. That’s wrong; the decay heat doesn’t drop off nearly that fast, the reactor vessel stays hot much longer. The steam pump works (for a while) by condensing the steam into the cooler water and pushing that cooler water up into the core. Eventually the torus water gets so hot it boils and with no relatively cool water to push up, the pumping action stops. So what’s “corium” exactly? Does it mean whatever’s in the fuel? For unit 3, not just uranium as mentioned above but also plutonium, right? I also saw the term corium used in one of the papers you have listed here recently, though I can’t remember which one. As I understand the term, it is the substance that results from a meltdown, so it is fuel, control rods, bits of pressure vessel and anything else that it comes in contact with. Pingback: Aaarrgghh Wanted: Best Jap radioactive horror stories, the more outlandish the better.